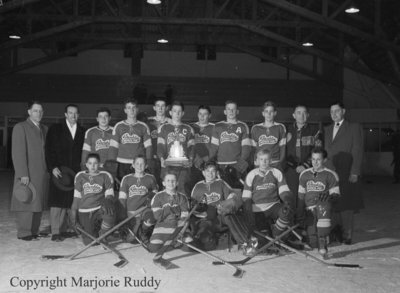 Black and white negative of the Brooklin Business Men, Ontario Minor Hockey Association Bantam D champions. The Brooklin Business Men defeated Lucknow in the finals and won the Ken G. Waters trophy. Back row: Cliff Johnston (manager), J.L. Christie (O.M.H.A. secretary), Ron Jones, Neil Pascoe, Charles Grandy, Paul Tran, Keith Kaine, Ken Roberts, Gerald Davies, Lorne Tran (coach), Jim Austin (O.M.H.A. executive). Front row: Charles Labanovich, Elmer Tran, George Tran, Bill Asling, Lorne Disney, Bill Biggs. Brooklin Business Men, March 19, 1954, Marjorie Ruddy. Whitby Archives A2013_040_993.